Hollywood, CA (The Hollywood Times) 1/14/19–Don’t Come Back From The Moon would be a sleeper of an indie film, in a good way, but instead becomes a sleeping giant with the credits being carried by James Franco. Franco barely has any screen time, but plays a character representing a major theme in the movie. Franco plays a frustrated father who gives up in the wake he cannot find meaning in the desert town in which he resides. 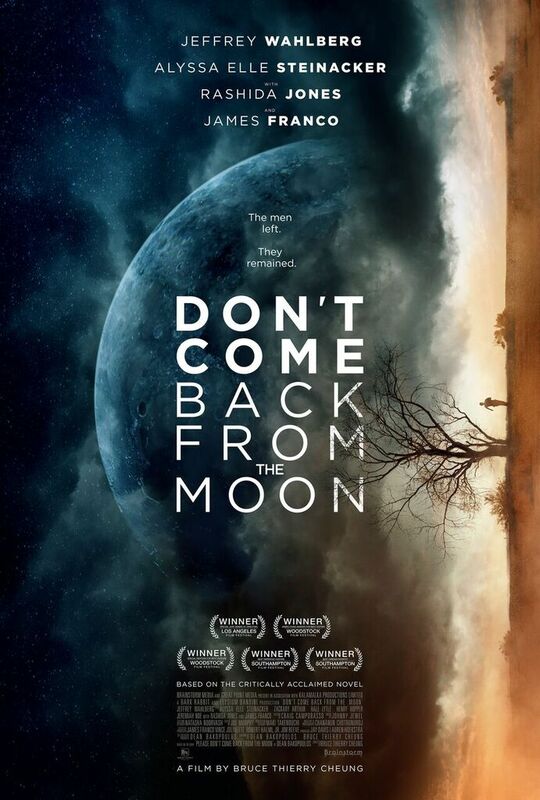 His exit to “the moon” is just a metaphor for the mystery of ‘where do all the dad’s go when they leave their families?’ This leaves the main character and up and coming star Jeffrey Wahlberg to begin to adapt without his father and come into his own. With other kids in town also going through the same exact thing he’s able to find commonality with his peers as they all take their frustrations and sadness out through partying and petty crime. Wahlberg shares screen time with Alyssa Elle Steinacker, which is spent putting over a lot of innocence between the characters. When they connect, a lot of the initial guard is dropped from the tension of being lost. Through their friendship they are able to explore feelings and come of age quickly. Like most young loves, this doesn’t last and their separate paths add more to their feelings of being lost. Initially released at the Los Angeles Film Festival, the film seems to have only gotten better with time. Jeff Wahlberg’s uncle Mark would be proud as he is able to carry the movie with the absence of Franco. In 2018 Jeff Wahlberg will return to the screen with Franco in a sci-fi desert film. When I pulled the curtain to see what may be behind a movie’s production, this was an easy connection to make. I could see how Franco’s presence behind the scenes could really drive the piece of art. Franco may have found the right actor to mentor and pass on his know-how. A still from James Franco’s latest indie film. Rashida Jones, who I normally dislike, surprisingly nails her role as the abandoned mother of an adolescent and a child. She can do so much with so little. She wears sadness like a badge of honor, while not seeming abnormally weak. What’s so great is that she can come across so bland; but that is what this direction and production showcases. The idea of a desert town, where there’s presumably nothing to do, and fathers are leaving their families, screams ‘bland’. The filmmakers use the landscape, colors, camera, and music to bring you into another world. Cinematography is one of the film’s many finer points. The soundtrack was absolutely exhilarating and made it easy to curl up and take in others pain while ignoring my own. Music from the likes of Glass Candy, Emmanuel Top, and the Chromatics made me melt while the screen moved around from sunset to broken down trailer to desert road. The authenticity installed in each character also won me over as you see mullets, cowboy hats, all kinds of facial hair, and clothes that made me feel like this could be a series taking place at the same time as Stranger Things. In that line of thinking I also could see this being a Netflix series. I’m okay with it being over and done, but I’m left feeling like the movie went to the moon. What a very cool movie. Previous article#4 CES: I Can Hear Clearly Now – Or at least soon!